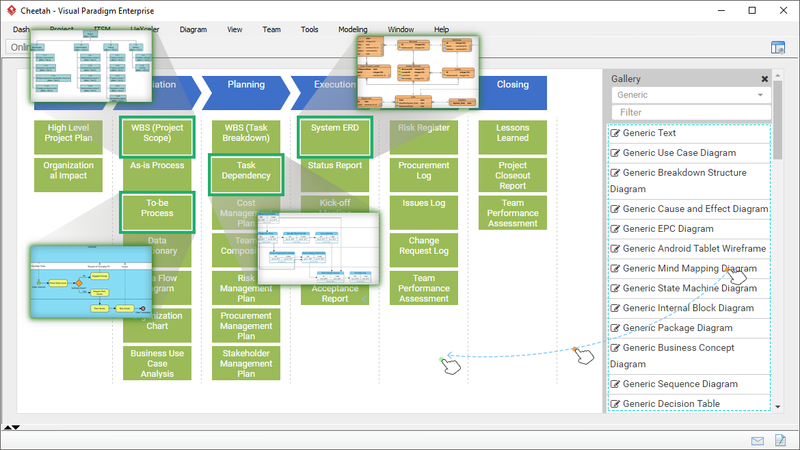 Design and execute your own development process, with tailored process templates. 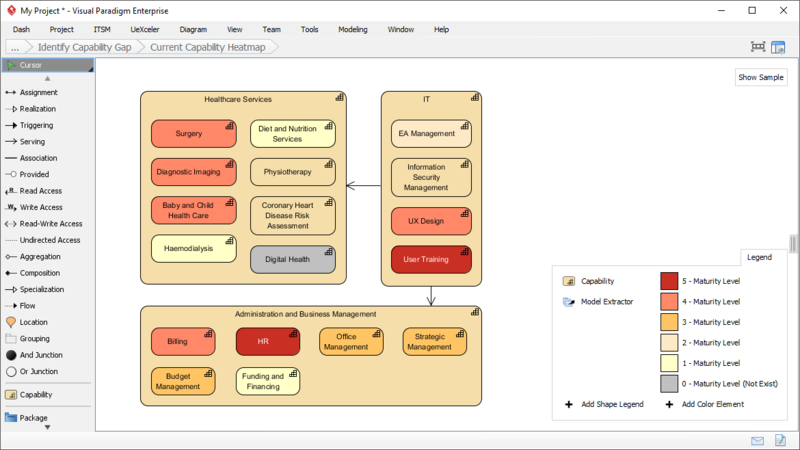 Flexibly configure your own development process in a two dimensional work item map. Simply configure the columns and rows of the map, and then add the work items you need into the map. We provide a rich set of work items that support most, if not all, typical IT projects and processes, covering PMBOK, TOGAF, project management, BMM, etc. All the work items are actionable. Process worker follow the steps and instructions defined in each work item to get the process done. 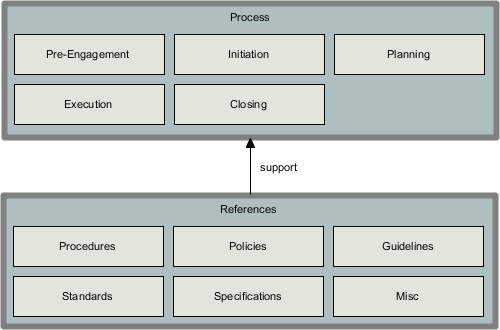 Need to adopt an agile development process? You can build a map in an agile fashion! 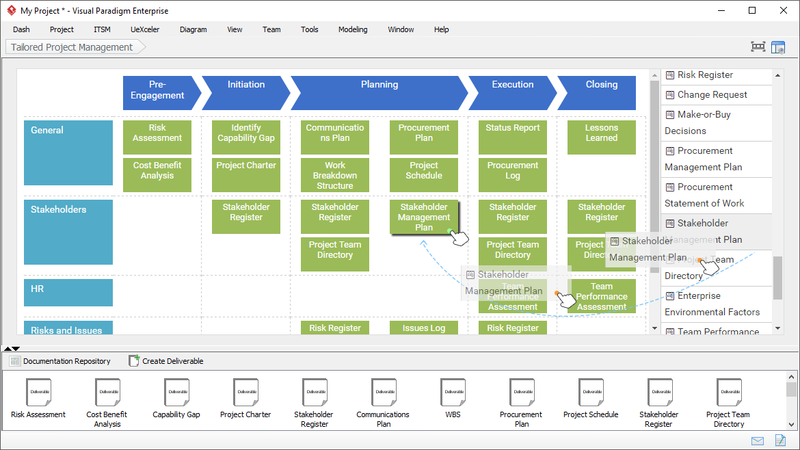 Instead of adding all the work items into process map upfront, just form an initial map with the work items required at the beginning, and gradually add more as your project progresses. Just in time, just enough! Work items mainly serve two purposes: Process data collection and problem analysis. Collection of process data is achieved by using work items that support form-filling, like the figure shown below. Typical examples of form-filling work items include project charter, issue log, lessons learned report. All the work items are well-designed and ready-to-use. You can include them in your process map without further customization needed. A typical use case of work items is for problem analysis (e.g. cost benefit analysis, maturity analysis). This kind of work items provide process workers with steps and instructions needed to conduct an end-to-end analysis. The finding of analysis will then be summarized and feed into a deliverable to be generated. 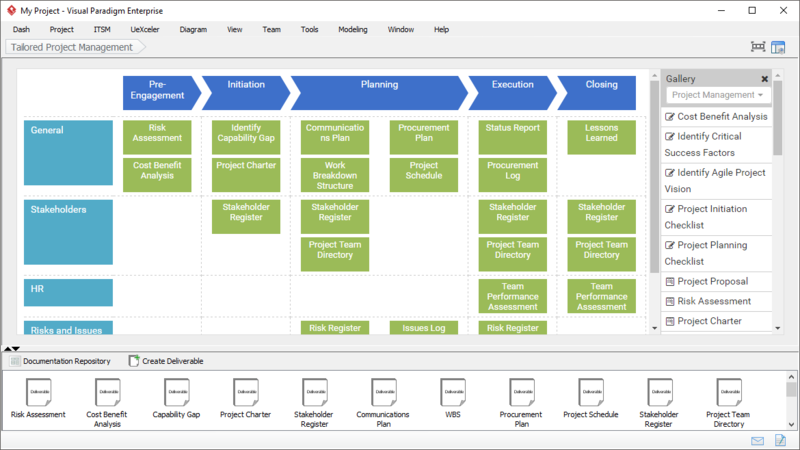 Hundreds of well-designed actionable work items are available to help you get started in developing your own process map instantly. Simply drag the work items from the gallery onto your map and that's it! We provide a rich set of work items that cover different processes and problem domain, which include TOGAF® ADM activities, PMBOK® and other general project management activities. 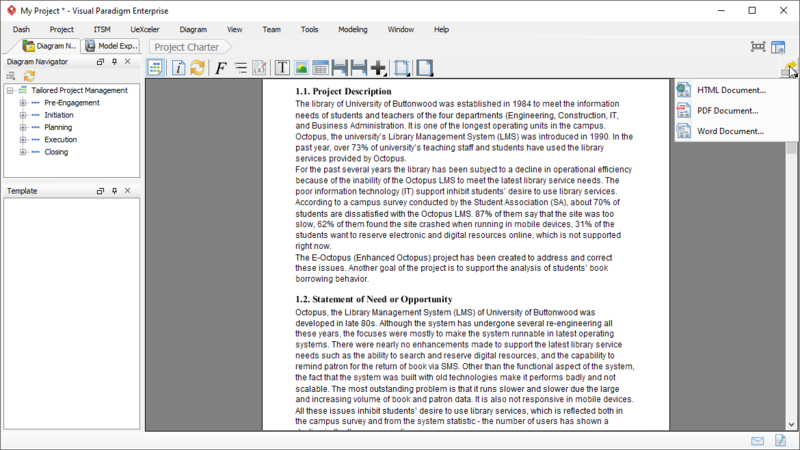 The information provided under work items will be consolidated and summarized in nice formatted, and yet customizable process deliverables. You can easily access the auto-generated copies under the visual File Cabinet, or to generate one on-demand. 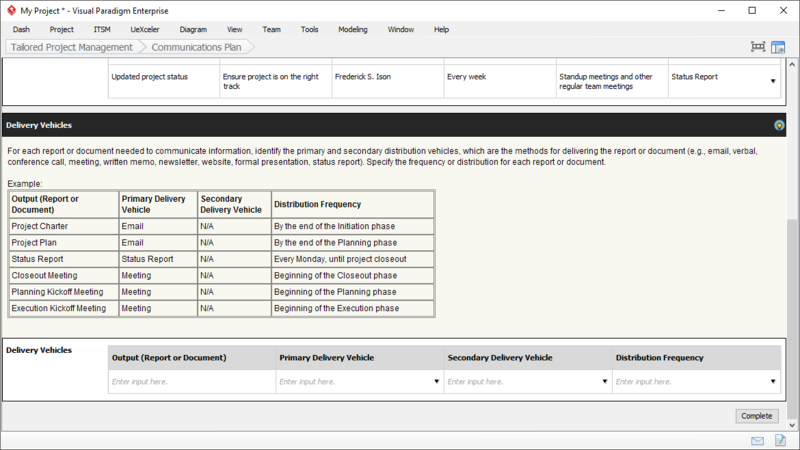 Incrementally develop deliverables by completing the forms and work items. 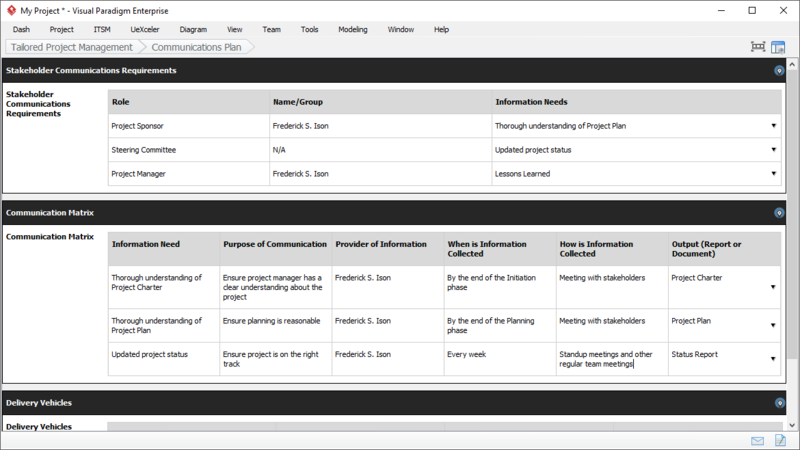 Generate deliverables using default deliverables templates or the Just-in-Time Doc. Composer at you own choice. 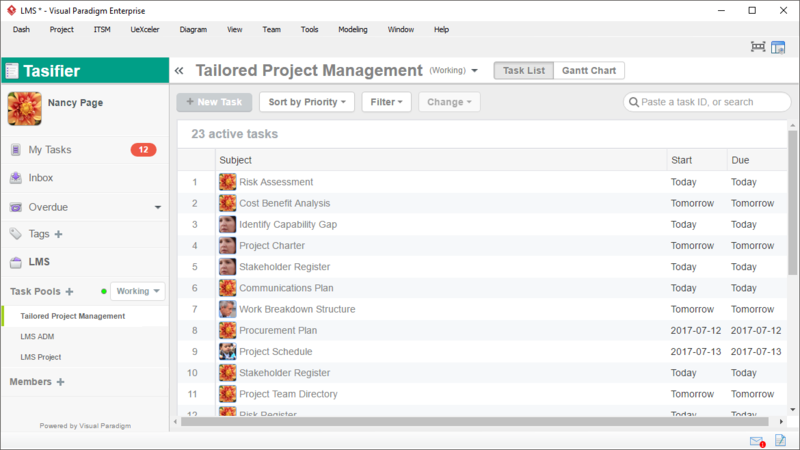 The collaborative work of your team will be automatically classified, versioned, and archived in the visual File Cabinet. You can easily find hundreds of references in the topic of project management and enterprise architecture, but that will cost you hours of effort for searching the relevant information to move a step forward! Visual Paradigm provides you with inline, step-by-step guide-through instructions together with samples for each step.